So I am TOC (temporarily on crack) and have willingly decided to participate in the One Room Challenge. 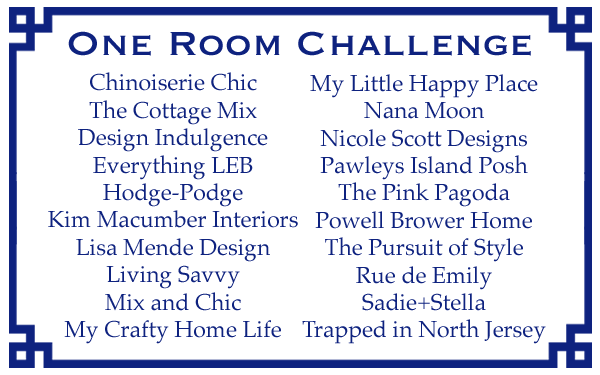 For those of you who are not familiar with the One Room Challenge, it is a 6-week self motivated challenge to finish a room in your home (or a client's) from beginning to end. Once a week all of the participant's will post their weekly progress. That's right all. Apparently I have other bloggy friends who are TOC. For those of you who are familiar with my blog, know that I do not play Rachel Ray and repeat the meanings of acronyms. I say it once for definition. The way an acronym should be used. 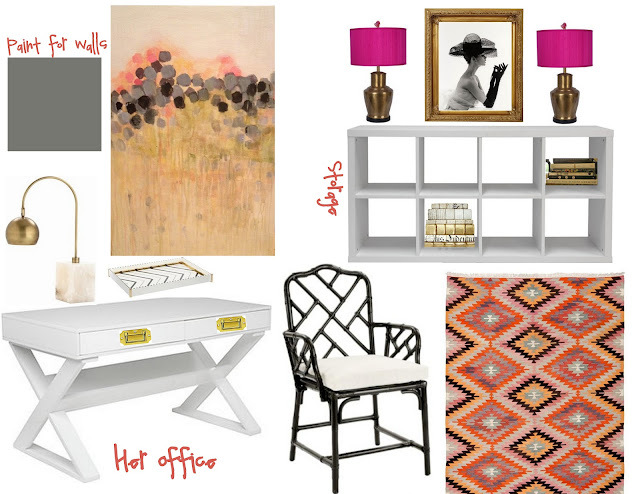 For this One Room Challenge, I decided my office would be best suited for the most shocking and extreme makeover from start to finish. Here are the humble beginnings of the space. So before we get to any progress that I have made, I think showing you the intended direction of the space would be oh so key. This will be a reminder to you old time S+S followers, but a newbie for our new loves. Here is the original plan for my office space. Here would be the most basic update to the office. Oh what moving boxes and crap does for a space. For those of you eyeing that dome lamp, it is my personal Ikea Hack. It is perfect for the space. Ruh roh. Ok. So the boxes and crap are not entirely cleaned up. Sigh. We are going to play "Where is the golden hand?" Do we spy it in multiple places here? Very Kelly Wearstler, right? Yeah, I spray painted a cast iron wall hook. My kind of DIY. Ok so I lied. A little more progress has been made. This girl needed her gallery wall completed. I mean seriously. I thought maybe some of you might be interested in these prints as well. See the links below. Go and check them out and show them some L.O.V.E. Maybe while you are there, offer them a valium and a cocktail. Something tells me they will gladly accept. This is gorgeous. I'm dying over your board. It's very very puuuuurty. I'm pretty much in love with your desk as well. So fab love! wow!! can't wait to see it. love that brass lamp. Bahaha! Rachel Ray!!! Too funny! Can't wait to see the room!!! Love it all! Where is the desk from??? Love your desk. Mine is so sad with paint chipping off and food stains from sterling! I can't wait to see what you do. Already loving the gallery wall plus fabulous lamp makeover! Love the design board ... the crispness and the color!! rachel ray? ha!!! lovvvve this room already! let's talk about that gallery wall...how do you say it? oh yeah, perfection. I love where the room is headed, you are definitely brave to take on this challenge so soon after moving in. I had a question for you. In your orginial mood board, where is the art from? Love it all. And you are already ahead of the game with the gallery wall. Can't wait to see how everything else comes together!! That lamp is killer btw. This is so fun! I cannot wait to see how it turns out. Your gallery wall is looking super fab! You go girl...anyone who sets up a gallery wall FIRST is my kind of gal! Loving a few things in the space already...the desk(super)and the southern moonlight silouette (divine)...can't wait to see where you go.. The office is going to rock! I love the dark walls.. and yes drooling over the dome lamp! That is also on my todo list! The room looks so great I love that gallery wall! Love seeing my ballerina print next to so many other cool prints. Thanks for sharing! I mean that lamp gets me every time. I can hardly stand it. must get my hands on one. Loving your inspiration board and can't wait to see you transform this space! Love this, and the direction you are headed is sure to turn out fab. Good Luck!! I'll be checking back often! I love the pictures in the frames, lovely feature. Oooh I love the gold framed gallery wall. LOVE the gold photo wall! For you to be tackling this so soon after a move is VERY impressive. I still have unopened boxes from my move 4 years ago. It's going to be so incredible -- I'm still dying over the IKEA hack! I love your inspiration board, can't wait to see what you come up with!! It's going to be fab. I could have done my guest room...but it does have boxes in it and I am just not in the mood to sweat right now and carry them to the basement. I love your stylish design plan. The desk, gallery wall and the gold pillows are absolutely gorgeous! Is the desk from Z Gallerie? Can't wait to check out your room's progress next week! You can totally do this and it's going to be ahhhh-mazing! Can't wait to see the fruits of your labor! Looks like you have it going on! Love your desk and lamp. The gallery wall is FAB-U-Lous. You are moving at warp speed. How about another grilled veggie on the barbie? ?